One of the most abundant foods in the Fall is Pumpkin! There are large quantities of them at stores, farms, farm stands, and outside homes right now. I always feel excited when I see the first pumpkins. They signal the height of fall - one of my favorite times of year and elicit my fun childhood memories of pumpkin carving and trick-or-treating. It seems that the majority of pumpkins are used for decoration or carving, and that their true glory as a health food and skin treatment are often unknown. But, it's worth knowing that the flesh and the raw seeds and seed oil of pumpkin, make a delicious and nutritious food to eat and treatment for skin. Pumpkins are indigenous to the Americas and have been domestically grown here for five thousand years. Native Americans used pumpkins seeds and pumpkin as both a food and a medicine. Pumpkins are very high in carotenoids (powerful antioxidants), thus giving them their vibrant orange color. They are also high in the antioxidants lutein and zeaxanthin, which destroy free radicals in the eyes, thus helping to prevent eye disease. 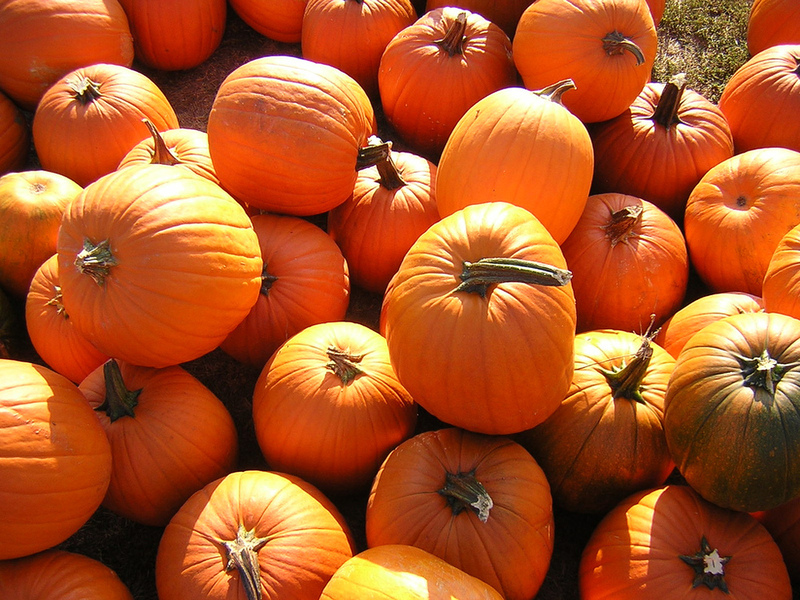 Pumpkins also contain nutrients, like zinc, iron, potassium, calcium, vitamins C, E, A, and fiber. Pumpkin seeds, also called Pepitas, are very high in protein. They also contain copper, iron, calcium, potassium, magnesium, manganese, phosphorus, niacin, and zinc. They contain most of the B vitamins, as well as Vitamins C, D, E, and K. Pumpkin Seed oil is high in essential fatty acids (EFAs), making it wonderful for skin and all body tissues. This oil is also high in phytosterols, which are plant-based fatty acids that are chemically so like cholesterol that they can replace it in the human body, contributing to the reduction of blood cholesterol levels. Pumpkin seeds can be used to treat prostate, bladder problems, depression, and are great for expelling intestinal parasites. Pumpkin is a natural and healthy way to care for your skin, including premature aging, sun spots, clogged pores, and a dull, uneven complexion. Pumpkin is a great source of enzymes and Alpha Hydroxy Acids (AHAs). These enzymes and AHAs exfoliate, revitalize, and remove impurities from the skin. Pumpkin contains a large array of vitamin A derivatives, which are responsible for cellular renewal, zinc for skin healing, and vitamin C for preserving and strengthening the health of skin cells. The oil in pumpkin seeds contains essential fatty acids, which moisturize and help regulate proper skin sebum production. This is important for normalizing oily skin, and also balancing dry skin. Pumpkin seeds also contain zinc, which is essential for skin healing. Are you carving pumpkins this Halloween? If so, here are some wonderful ways to use the remains of pumpkin. Or just buy a small pumpkin and play. Would you like a healthier version of a traditional Halloween snack? Click below for my recipe on how to make enzyme-rich raw "roasted" pumpkin seeds. What about a healthy version of a classic Holiday Pie? My favorite! - Pumpkin Pie. Raw & nutritious. Click below for my recipe.